“For too long, we have seen the effects of a top-down, ‘Washington-knows-best’ approach to our lands and natural resources. I hope the president will trust and empower western states and our local communities, who are more familiar with their circumstances and needs than Washington bureaucrats,” said Congressman Greg Gianforte. A fundamental principle of our Constitution is the belief that local governments are better suited to deal with local issues than a distant, out-of-touch federal government. State and local governments are closer to the people, more responsive to citizens, and better equipped for representing their constituents on many important issues. The Tenth Amendment explicitly states, "The powers not delegated to the United States by the Constitution, nor prohibited by it to the States, are reserved to the States respectively, or to the people. Recently, however, this tradition of constitutionally established local control has been seriously eroded due to usurpation of power by the federal government. Despite the history of states and local communities properly managing their resources in a sound, environmentally friendly way, the federal government has sought to seize control of management decisions through over reaching mandates and unconstitutional regulations. The Obama Administration's Clean Power Plan, WOTUS rule and Fracking rule are prime examples that far exceeded the intent of any statute ever passed by Congress. There are countless other examples of the federal government overstepping its constitutional limits and encroaching on state power. Some issues are inherently federal in nature, but those that are not should be left to the states and localities. When the federal government decides that a bureaucrat in Washington, D.C. should make decisions on local issues, often the result is contempt and frustration by people that are impacted. Federal agencies have no accountability, and the input of those who must live with the agencies’ decisions is often ignored. The Western Caucus seeks policies that empower individuals, states and communities to conserve natural resources and grow their economies simultaneously. We support locally driven, incentive-based policies that reduce bureaucracy. Coordination-based federalism is at once the law of the land, as well as the most efficient and fair way to implement policy in an environment in which federal policy routinely impacts local conditions and governance. Unfortunately, federal agencies have routinely ignored the land-use plans, programs and policies of local stakeholders when making important land and resource planning decisions. The informational deficit that exists between federal bureaucrats, on-the-ground officials and stakeholders ensures that top-down governance consistently poses significant problems for the local communities affected by said federal policies. Their lack of recourse against the agencies in question can make these problems intractable—when pursuing coordination in the first place would have sidestepped many of the problems that ensued. 22 Members of Congress signed and sent a letter to President of the United States Donald J. Trump requesting that the administration implement an Executive Order and three policies and that would improve coordination between federal government and local communities. This Western Caucus initiative aims to give stakeholders a seat at the table and would result in better land and resource planning decisions, reduce disputes, and strengthen the overall planning process. Click HERE to read more. H.J. Res. 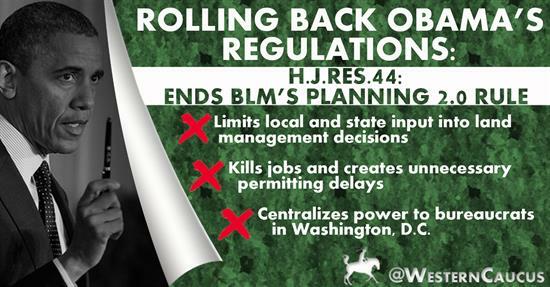 44, a Congressional Review Act bill by Rep. Liz Cheney that blocked the BLM’s Planning 2.0 Rule. Planning 2.0 changed the BLM’s resource management planning process, and introduced significant uncertainty by creating ambiguous standards and expanding agency discretion. This new rule complicated effective resource planning while reducing opportunities for meaningful state and local governmental input. 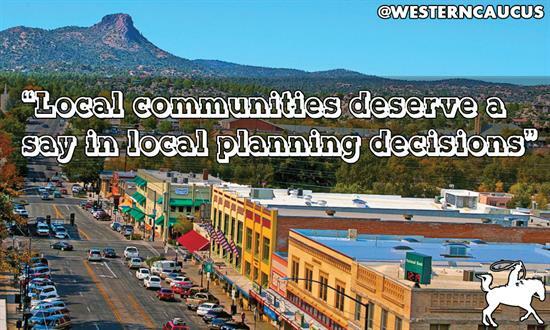 Planning 2.0 took planning decisions away from local communities and centralized those decisions with bureaucrats in Washington D.C. The rule also allowed radical special-interest groups from other states to have the same influence as county and local officials when developing important Resource Management Plans (RMPs). This was a significant departure from the planning process that has existed for more than 30 years and allowed for significant local government involvement. Fortunately, the Western Caucus took action and blocked this misguided Obama regulation via public law. Click HERE to read more. On August 5, 2016, the Department of Interior and U.S. Fish and Wildlife Service released its final “Non-Subsistence Take of Wildlife, and Public Participating and Close Procedures, on National Wildlife Refuges in Alaska” rule. 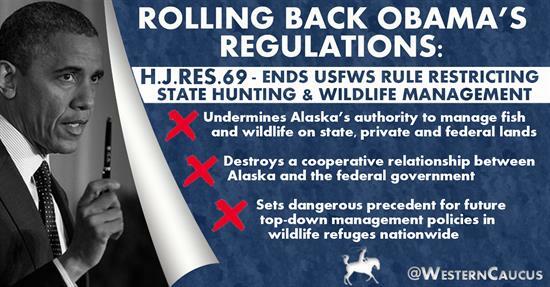 The rule fundamentally undermined Alaska’s authority – outlined in the Alaska National Interest Lands Conservation Act (ANILCA) and the Alaska Constitution – to manage fish and wildlife on state, private and federal lands. The rule applied broadly to 16 federal wildlife refuges in Alaska, amounting to 76.8 million acres or 20 percent of the state, and seized management authority away from the State of Alaska for both non-subsistence and subsistence uses. This power grab threatened management policies in wildlife refuges nationwide and if it would have been allowed to stand would have set a dangerous precedent for future top-down mandates from the federal government that seize authority from states. Once again, the Western Caucus took action and blocked this misguided Obama regulation via public law. Click HERE to read more.